They are two winged insects belonging to the Family Culicidae. The most important man biting mosquitoes are Anopheles, Culex, Aedes. Anopheles species are the vector of transmit malaria diseases. Culex species are the vector of transmit filaria diseases Aedes species are the vector of transmit yellow fever, dengu, Zika, etc. Mosquitoes are flies in the family Culicidae. Over 3,000 known species of mosquitoes exist worldwide. Adult mosquitoes are characterized by having long, slender, needle-like mouthparts (proboscis), antennae, and legs. Their narrow wings are often covered with minute scales. Fine scales cover the mosquito body and vary in coloration from white, silver, or gold, to very dark. Pattern arrangement and scale coloration are often useful for identifying mosquito species. Despite their delicate appearance, mosquitoes are aggravating pests of humans and other animals. Bites from mosquitoes can cause severe discomfort. The resulting intense itching is due to an immunological reaction to mosquito saliva injected into the bite wound. The real danger, however, is that mosquitoes may vector disease organisms. Mosquitoes are capable of transmitting disease-causing viruses, protozoans, and filarial nematodes. The most important mosquito-borne diseases are caused by viral pathogens and include West Nile fever, eastern equine encephalomyelitis, St. Louis encephalitis, western equine encephalomyelitis, and La Crosse encephalitis. * Mosquitoes have four distinct developmental stages: egg, larva, pupa, and adult. 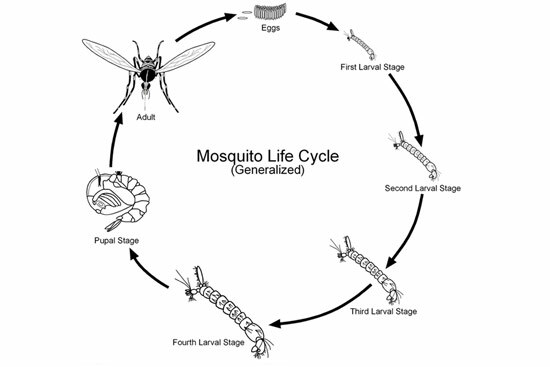 Immature stages of mosquitoes require water to complete their life cycle. Mosquitoes are poikilothermic (cold-blooded) animals, thus their rate of development and other aspects of their physiology are temperature-dependent. As the temperature increases, their development time shortens. * A freshly laid egg is light in color and darkens within a few hours. Mosquito eggs are oval and about 1/40th of an inch (0.635mm) long. Eggs are either deposited singly or as an egg raft depending on the type of mosquito. A standard egg raft is about 1/4 inch (6.35mm) long and contains 100-200 eggs. 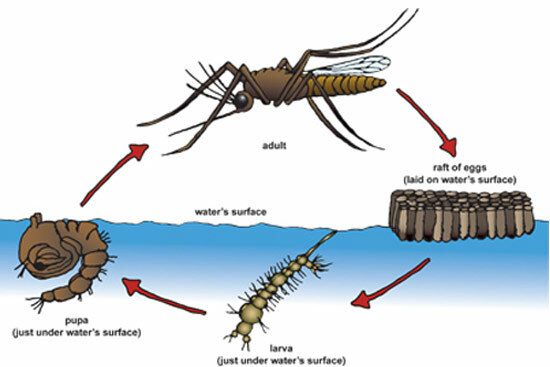 Some species of mosquitoes lay their eggs singly and deposit them directly on water or floating aquatic vegetation. Others will lay their eggs on moist soil that is subject to periodic flooding, or above the water line in natural and artificial containers. The number of single eggs laid per batch varies within and between mosquito species and can range from 60 to 200. * Larvae will emerge from eggs within 2-3 days when environmental conditions are ideal. All mosquito larvae go through four developmental stages called instars. First instars are barely noticeable to the human eye. Last larval instars of some species can be approximately 1/2 inch (12.7mm) long. Larvae move through the water in a serpentine motion. When they sense a shadow or movement in their habitat, larvae will quickly dive to the bottom to avoid the source of disturbance. * Larvae have a well-formed head and lack legs. Upon careful inspection one can distinguish the wider thorax from the long and slender abdomen. A tube-like structure, called a siphon, is located at the tip of the abdomen. Larvae use the siphon to breathe air from the water surface. Larvae possessing a siphon (Culicine) hold their body roughly at a 45-degree angle from the surface. Species of mosquitoes lacking a respiratory siphon (Anopheline) hold their body horizontal to the water surface. They obtain air through openings located on the dorsal surface of the abdomen. A few species will bore their siphon into stems of aquatic plants to obtain oxygen. * Mosquito larvae can be found in a wide variety of habitats, including temporary floodwater and pools; more permanent water habitats like marshes, swamps, lagoons, and ponds; stagnant waters; and natural and artificial containers. Shallow water is ideal for larval survival because there is less turbulence and wave action. Upper water movement interferes with the surface feeding of some mosquito species, and in most species, it hinders the larvae and pupae from obtaining oxygen at the air-water interface. A deep-water environment prevents bottom-feeding water from reaching food that has accumulated at the lower levels of the water column. Water quality in larval habitats can vary from fresh to saline to high in organic wastes. Different species can tolerate and thrive in water with varying degrees of organic content. * Mosquito larvae eat a variety of dead and living organisms, including detritus, algae, bacteria, and fungi. Some mosquito species are predaceous and feed on other mosquito larvae and small invertebrates. Depending on water temperature, crowding, and food availability, the larval stage is typically completed in 5-6 days. * Mosquito pupae are active when compared to other insect pupae. Pupae move in a somersault fashion through the water. Pupae breathe through tubes located on the thorax and will remain at the water surface unless they are disturbed. This non-feeding stage can be completed in as few as 2-3 days. * Both male and female mosquitoes feed on sugar sources such as plant nectar and honey dew, but only females feed on blood. Female mosquitoes use proteins and lipids from the blood meal to develop a batch of eggs. There are a few exceptions to this rule. Some species are autogenously, meaning a female is able to utilize energy reserves from the larval stage to produce eggs without a blood meal. All flying insects to be controlled as we mention before. The methodology to be followed, all the breeding areas to be treated to eradicate larvae, the space treatment program to be set in the place with trapping system (Mosquito Magnet) & ECO friendly trap for monitoring and mosquitoes other flying insect population.